Another enjoyable chapter. Kevin's dynamics with his father, with Oscar, with Uncle Eduardo, all continuing to fascinate. I claim credit for some of the ideas in this latest instalment, quite legitimately, though my contribution turns out to be very little. Unfortunately I've forgotten many of the aspects taken from real life, apart from the ones I suggested myself. There are some interesting secrets about when this story was written and how it and future plans have influenced each other, but to untrained eye, I think it fits seamlessly into the series. I particularly like the glimpses of school life that we get, as these are very relatable (particularly to one who went to the schools that inspired them - although my year group was not forced to get naked and have showers, or at least, the girls weren't). It is my hope that this episode takes an interesting look at Kevin's relationships with the other main cast members at the halfway point of the series. Clearly I've been carrying around a lot of repressed emotion about my school experiences for the past twenty years or so, and I'm very grateful to Kevin for helping me to channel some of it at last. Episode 7: January - Friends for Life, by Jake and me. Kevin and his friends are assigned a school geography project, while Eduardo is visiting Stanford University with his fellow Ghostbusters. Both groups find they must complete tasks and confront feelings that they did not anticipate. Episode 8: February - Affairs of the Heart, also by Jake and me. Another good one. I think just about everybody had at least one good moment. I really like how the two separate sequences of events in this episode complement each other with their strong themes of friendship, support and understanding. The meticulous matching up of timings, including the careful consideration of the time difference between California and New York, also deserves a special mention. 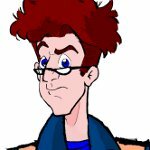 The Third Rock From the Sun stuff is a fun way to populate Stanford with the necessary guest characters, and it's an unusually accessible reference for the audience! On a purely personal level, I enjoyed exploring Michael's more vulnerable and less aggressive side, and I got plenty of warm fuzzies from Kevin as he decided to make friends with someone unexpected and unpredictable, because Kevin is simply a great guy! I also enjoyed reliving some more of my secondary school experiences, although the person who annoyed me with the "work" he did on our group geography project had far less good-friend potential underneath it all than Mikey clearly does! Episode 8: February - Affairs of the Heart, by Jake and me. On Valentine's Day, Kevin's school art lesson proves to be an unexpected source of conflict. Meanwhile, back at home, Carl is worried about his marriage and making veiled attempts to seek advice from his romantically fulfilled brother. Episode 9: March - Boys Will Be Boys, by Jake. First of all, I want to apologize profusely for taking so long to comment. Secondly, I want to apologize profusely for finding myself without much to say about it. It was another fascinating character study, and I especially liked Carlos trying his best to not be an ogre for just a little bit. It can't be easy for him--but kind of fun for us--to see him basically squirming at feeling like he has to ask his little brother for advice. 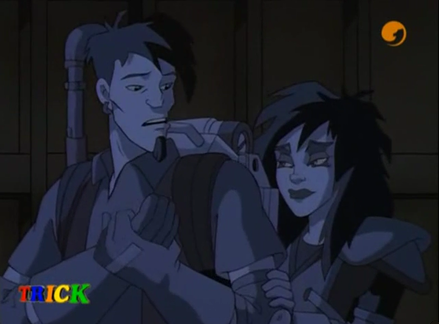 It was whilst writing my contributions for this episode and the previous one that I came to realise that my chief interest in this new Ghostbusters-originated universe had become Kevin's relationships and interactions with the OCs (and Oscar, of course) which I suppose might potentially lead to someone reading some parts of The Riveras and thinking "This has nothing to do with Ghostbusters" or something similar. As it is designed to be a spin-off series, I feel that developing Kevin as a protagonist is definitely a valid thing to do, and I have become extremely fond of and enthused by him and all his contemporaries. I have always shipped Eduardo and Kylie, and been fascinated by Eduardo's relationships and history with his family - 'Rage' is one of the most "pregnant" twenty-minute cartoon episodes of anything I have ever watched in my life. Consequently, I think it's wonderful to see Eduardo's interactions with his family and Kylie continuing to evolve and develop in such interesting and engaging ways (which does have something to do with Ghostbusters, of course) and I hope that Kevin's adventures and developments outside the family sit nicely in parallel with this more familiar aspect of the series. Personally, the idea that excited me most in this episode was revisiting the Michael and Ella relationship, and how Kevin might find himself once again involved with the pair in a way he was neither expecting nor keen to engage with. I thought it was important for Kevin and Michael to exchange a few physical blows before finally cementing their friendship, as all the best would-be alpha males have to do this before truly becoming friends for life. I also wanted to make it quite clear that Kevin gave himself the chance to give Michael an absolute pasting but then made a conscious decision not to do it, which I feel is exactly the opposite of what Carl would have done in that situation. Kevin and Oscar's spring break is filled with highs and lows when a perilous adventure in the Connecticut countryside proves to be a valuable experience. In the meantime, a certain member of each family has questions about the boys' relationship. Episode 10: April - Girls' Night Out, by me. Lol...I have to admit, having read more than my fair share of "hurt/comfort" fics over the years, it was interesting to see one with some of the same overtones...but done well. Oscar grappled with his sexuality in the GBOT/Ectozone timeline as well, and Rosey dropped hints that his "one true love" (or as close as it gets) was (if I recall correctly) one of the other men in his band, but Rosey basically stopped writing those stories before we found out if anything was going to come of it. GBOT Kevin eventually married a woman and their daughter will be born next year, but that doesn't mean he didn't have some confusion...and it doesn't mean that things turn out the same way in the "Collinsverse" either. Another good story, and looking forward to more. Thanks as always for your comments, Fritz - not that I had very much to do with this one (just a few minor suggestions ). Oscar grappled with his sexuality in the GBOT/Ectozone timeline as well, and Rosey dropped hints that his "one true love" (or as close as it gets) was (if I recall correctly) one of the other men in his band, but Rosey basically stopped writing those stories before we found out if anything was going to come of it. There has never been any doubt in my mind that GBOT Oscar was bi, but - sad to say - I seem to remember I encountered a certain amount of resistance against the direction that would lead to him actually hooking up with his friend/bandmate Danny, and in those days I had a regrettable habit of bending with the wind if it was strong enough. Goodness only knows. The wife and daughter have never been anything more than names. For some reason I didn't do anything very deep with Kevin before, did I? Anyway, back to this story, I was particularly pleased with the interaction between Eduardo, Carl and Kevin at the end, particularly the 'you can get out of my house' exchange. Based on what we see in 'Rage', it rings very true. I think our development of Carl is turning out particularly well, especially as it's something that's come about organically, rather than being the product of a lot of discussion and difficulty. My original intention when I got Kevin and Oscar together in the EGB virtual season was to give them what is nowadays termed a bromance (which they still have, notwithstanding the fact that there turned out possibly to be more to it) but that Carl would worry the boys were developing feelings for each other that were more tender and more physical than he himself could ever feel comfortable with. Thanks to Rosey's GBOT fics, I have always thought of Oscar as a bisexual character, and originally I thought that the right thing to do was to keep the exact nature of Kevin's sexuality ambiguous, as the truth of the matter was not nearly so important as the fact that Kevin was growing and maturing towards being able to come to terms with his true self in his own time and his own way, in spite of any objections his father might have about this and other aspects of his life. However, as I wrote more and more about Kevin and Oscar, they developed an extremely strong relationship based on mutual support, understanding, fun and physical interaction, which I myself had absolutely no control over but was extremely happy to run with, and hopefully the following is a tantalising promise: there is certainly more to come from Kevin and Oscar in this new 'Collinsverse', but it won't be for quite some time. Anyway, I'm very glad that Kevin and Oscar's relationship (whatever its eventual nature) seems to be coming across in a positive and believable way, and that the continuing story of Carl and his family dynamics has successfully found its place in this episode as well. There are also a few more insights into my own life here, including the day almost two years ago when I was helping someone with an injured foot to hobble through some woodland, although if there was any hurt/comfort vibe going on in that particular situation, I utterly failed to pick up on it. Kylie persuades Beth to accompany her on a night out with the girls during Kevin's sleepover. This arrangement leads to some female bonding both inside the Riveras' house, and on the streets of Manhattan. Episode 11: May - Love and Understanding, also by me.